Since I started blogging my recipe reviews over on the Huffington Post UK blog I’ve more or less completely stopped reviewing cookbooks on this blog. I’m organising a full archive with links to all of the cookbook reviews I’ve done. It’s taking me a while because I keep changing my mind about how I want it organised – this is nothing unusual for me! That will be coming soon. I’ll be doing a couple more cookbook-ish things as well in the future but for now I thought I would do some mini reviews of books that have been out a while but that I have gotten out of the library recently and enjoyed. So here’s the first. 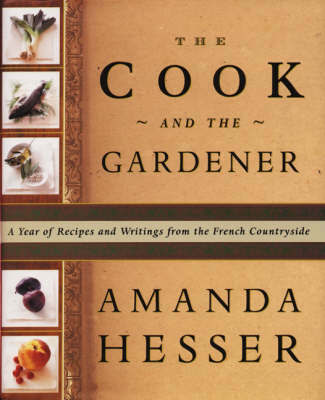 “The Cook and the Gardener” is all about Hesser’s (the cook) time spent at the Château du Feÿ and the influence of Monsieur Milbert’s (the gardener) walled garden and wonderful vegetables. This is pretty much the ultimate lifestyle/recipe book. There are vast quantities of notes and long written sections with recipes dotted between them. The recipes themselves are organised in a seasonal frame with the best ingredients from each month highlighted one at a time. There are no photographs at all but small illustrations dotted through the book. It feels like something to sit and read on a Sunday afternoon while jotting down ideas for recipes for the week ahead. I am always on the lookout for cookery books that can become staples in the kitchen. Books like Delia’s Complete Cookery Course or the Ballymaloe Cookery Course where you know you will find the right flavour combination, a good lunchtime idea or the timings you need for a roast dinner. “The Cook and the Gardener” is along those lines and has a very impressive number of recipes. There is a lot of writing in here so if you want just recipes this is probably not the right book but if you like the story behind the food it is very well written. There are beautiful and rustic ideas all the way through that are inspired by classical French cooking as well as some lovely and innovative recipes. Some of the meals can be quite long and often run over several pages which makes it a bit more awkward to cook from but there are also lots of quick soups and sides. The notes that Hesser has included are wonderful and give a real insight both into her own cooking and also the way that you can adapt recipes to suit your own style. This is not an easy book to get hold of anymore but I would highly recommend grabbing it if you do come across it. Lots of beautiful ideas for everything from large dinner parties to a comforting, simple supper dish. A real treat.